Today’s piece is a bracelet. This bracelet is made with hand knitted elastic as the band. The centerpiece is a polymer over a copper piece. The image is of St. Michael the Archangel. On the reverse side of the medallion, the piece says: “St. 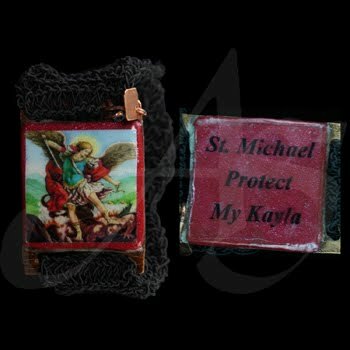 Michael Protect My Kayla”. If you would like to order a similar piece, or any unique piece of jewelry; contact us! Don’t forget to stop by our Facebook page, Google+ page, Twitter, or our website for more exemplary pieces of hand crafted art ware. Today’s piece is a Rosary bracelet. 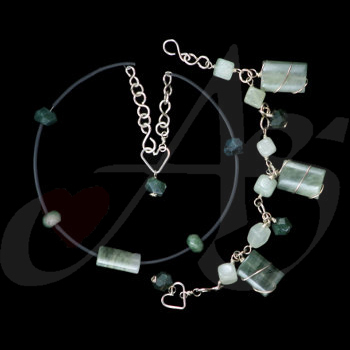 This bracelet is made with blue opal and copper metals. The copper sheet metal is hand cut and hand textured. The copper wire is hand twisted. If you would like a similar piece, or any unique piece of jewelry; contact us! Don’t forget to stop by our Facebook page, Google+ page, Twitter, or our website for more handmade pieces of jewelry. If you would like a similar piece, or any unique piece of jewelry; contact us! Don’t forget to stop by our Facebook page, Google+ page, Twitter, or our website for more exquisite pieces of art-ware! Today’s piece is a family rosary. 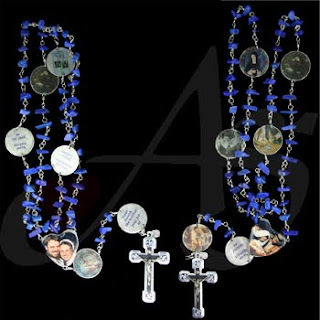 This rosary is made with lapis lazuli and creative imaging on each of the Our Father beads. Each of the images represents a stage in the family’s marriage and how it is led through the Holy Spirit. If you would like to order a similar piece, or any unique piece of jewelry; contact us! Don’t forget to stop by our Facebook page, Google+ page, or our website for more wonderful pieces of jewelry! Today’s piece is the first installment of our Christmas gifts. This is a family ornament set. 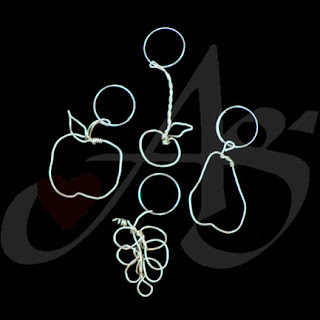 Each of the ornaments is made with hand twisted nickel wire, and wrapped with seed beads on a very fine, 33g wire. If you would like to order a similar piece, or any unique piece of art-ware; contact us! Don’t forget to stop by our Facebook page, Google+ page, or our website for more wonderful pieces of jewelry. Today’s piece is a necklace. This necklace Is made with Sterling Silver and ribbon. 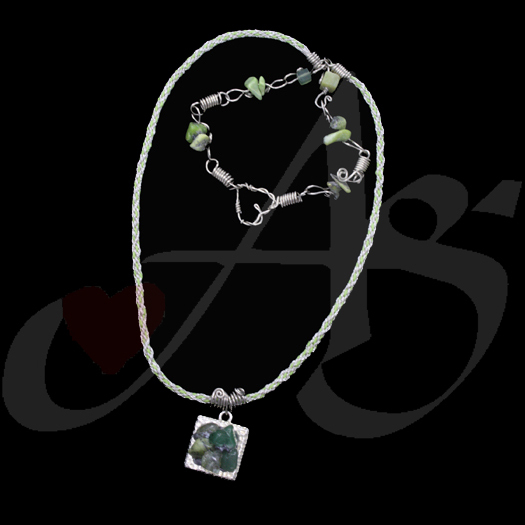 The necklace portion is made with two different ribbons and a green leather. 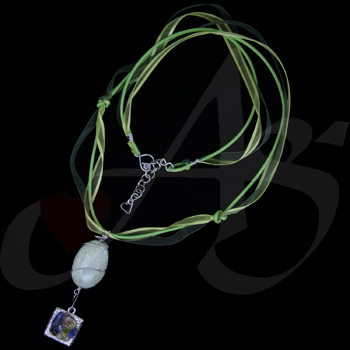 The large stone above the pendant is a green serpentine. The pendant is a a hand-filled rhodium pendant with select chips. This piece is currently available! If you would like this piece, a similar piece, or any unique piece of jewelry; contact us! Please stop by our Facebook page, Google+ page, or our website for more wonderful pieces of jewelry. Have a blessed and Merry Christmas! Today’s piece is the last in our installments of the new line. With that being said, we will be showing the personalized Christmas presents which were ordered for the next few weeks. This Necklace is made with a multitude of materials. 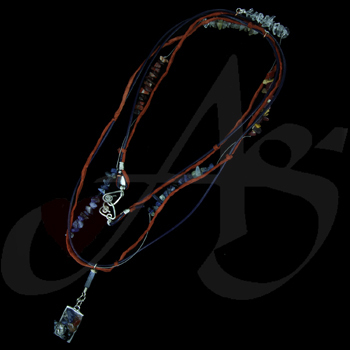 The cord is made with one strand of blue leather, and a strand of terra cotta silk. 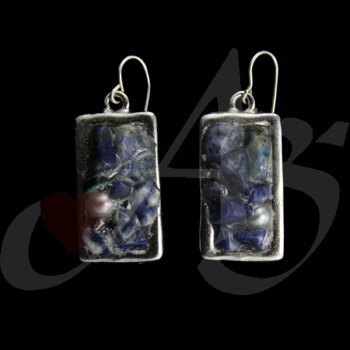 There are two sets of each of the three bead chip sets; Lapis Lazulite, Tiger’s Eye, and blue Iolite. The pendant is a Rhodium pendant hand filled with a mixture of the aforementioned chips. 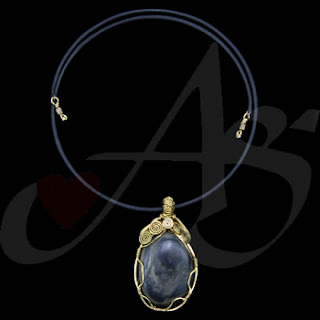 There is a lapis lazulite rectangular brick attaching the pendant to the necklace. This piece is currently available! If you would like this piece, a similar piece, or any unique piece of jewelry; contact us! Don’t’ forget to stop by our Facebook page, Google+ page, or our website for more splendid pieces of jewelry! Today’s piece is a necklace. This necklace is made with a purple polymer pendant with double sided imagine on purple rattails. On one side of the image are the Mother Mary and Jesus; on the flip side are the words, “Hail Mary full of grace The Lord is with you. Pray for us sinners”. This piece is clasped with adjustable sliding knots. This piece is currently available. If you would like to purchase this piece, a similar piece, or any unique piece of jewelry; contact us! Don’t forget to stop by our Facebook page, Google+ page, or our website for more great piece of jewelry! 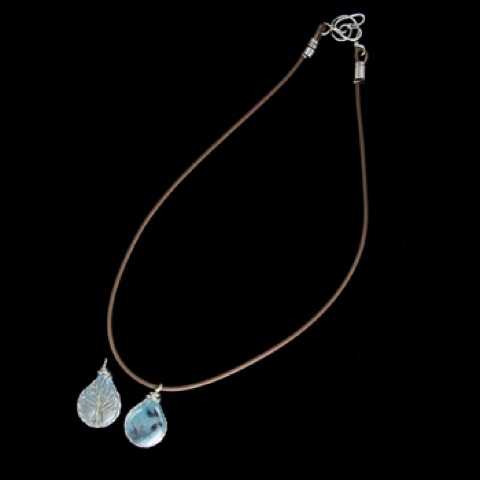 This Necklace With Pendant is made with teardrop small turquoise polymer clay. It features brown rubber chording. This piece has hand made hook w/ heart jump fastenings and findings. 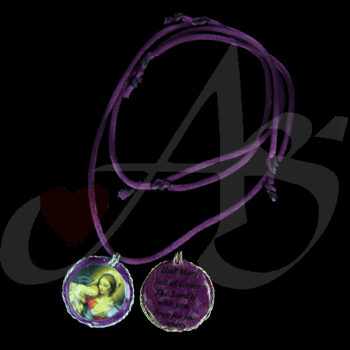 This item is decorated with a Blessed Mother Mary. This piece is no longer available. If you would like this piece, a similar piece, or any unique piece of jewelry; contact us! Don't forget to stop by our Facebook page, Google+ page, or our website for more wonderful pieces of jewelry! Today’s piece is a necklace. This necklace is made with a multitude of materials. There are shell composite, and many different types of metals. Each of the metals are hand stamped and hand textured. The shells are an array of colors to add a wonderful flavor to the necklace. 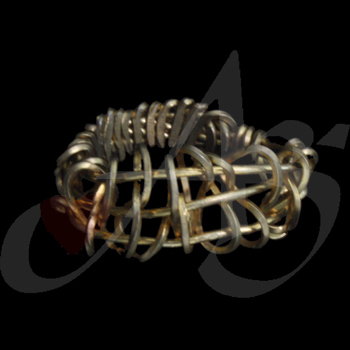 Linking the metal rounds and shell circles together is hand twisted copper wire. This piece is a wonderful accessory, and is currently available! If you would like this piece, a similar piece, or any unique piece of jewelry; contact us! 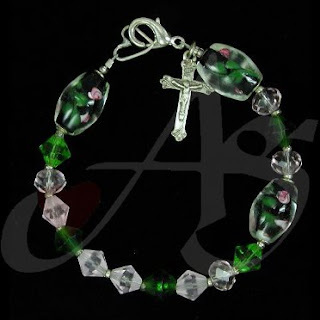 Don't forget to stop by our AgapeGifts">Facebook page, Google+ page, or our website for more wonderful pieces of jewelry! Today’s piece is a hand made choker necklace. This choker necklace is strung on rubber coated memory wire. The center pendant is a wire wrapped river stone. This piece is currently available! If you would like this piece, a similar piece, or any unique piece of jewelry; contact us! Feel free to stop by our Facebook page, Google+ page, or our website for more wonderful pieces of jewelry! Today’s piece is a fusion necklace. 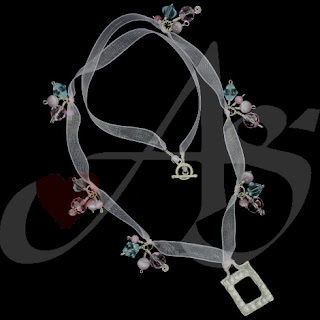 This necklace is made with ribbon and purple rattail. The necklace is connected with hand wire twisted copper. The centerpiece is made of hand cut and stamped copper with a purple US crystal. The necklace can be converted into a bracelet and choker, by removing the copper part on the right. This piece is currently available! If you would like this piece, a similar piece, or any unique piece of jewelry; contact us! Don’t forget to stop by our Facebook page, Google+ page, or our website for more splendid pieces of jewelry! Today’s piece is a bracelet. This bracelet is made with brass and copper. This piece also has two messages – the first being in copper “2|GOD|B|THE|GLORY”. The second is in the brass. One letter is stamped into each of the brass squares, with different sized font to spell “J-E-S-U-S’ and the ring of the toggle has “love” stamped all over it. This piece is currently available! If you would like this piece, a similar piece, or any unique piece of jewelry; contact us! Don’t forget to stop by our Facebook page, Google+ page, or our website for more wonderful pieces of jewelry! Today’s piece is a bracelet. This bracelet is made with hand cut and hand stamped copper wire. 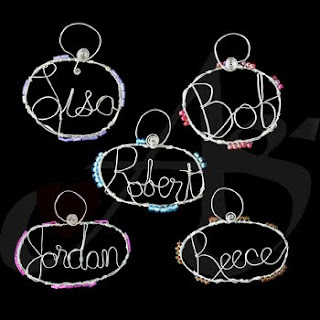 There are 7 Swarovski crystals attached with sterling silver wire. This piece is currently sold. If you would like a similar piece, or any unique piece of jewelry; contact us! Please stop by our Facebook page, Google+ page, or our website for more wonderful pieces of jewelry! Today’s piece is a bracelet. 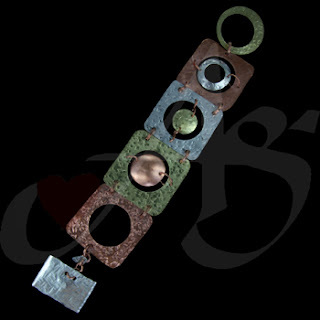 This bracelet is made with sterling silver, brass, and copper. Each of the pieces were hand textured, hand cut and hand punched. Each of the squares are attached with copper. This piece is no longer available. If you would like this piece, a similar piece, or any unique piece of jewelry; contact us! Don’t forget to visit our Facebook page, Google+ page, or our webpage for more wonderful pieces of jewelry! Today’s piece is a ring. 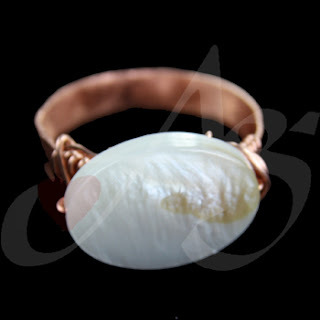 This ring is made from copper sheet metal, copper wire, and Mother of Pearl. This piece is currently available! If you would like this piece, a similar piece, or any unique piece of jewelry; contact us! Don’t forget to check out our Facebook page, Google+ page, or our website for more wonderful pieces of jewelry! Today’s piece is a handmade ring. 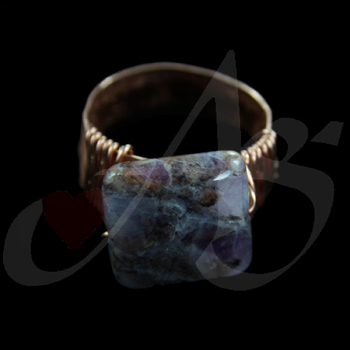 This ring is made with copper and a purple chalcedony. The chalcedony is adhered with copper wire. This piece is currently available! Today piece is a continuation of sharing our new line, however we are now moving into rings. 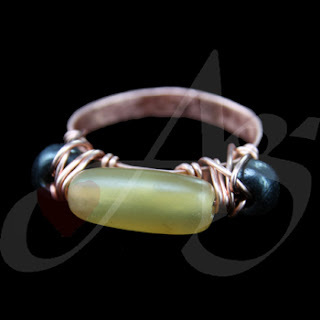 This ring is made with a base of hand cut copper sheet metal and copper wire. The center is a yellowed buffalo bone, with black wood on either side, and white buffalo bone outside of the wood pieces. This piece is currently available! If you would like this piece, a similar piece, or any unique piece of jewelry; contact us! Don’t forget to stop by our Facebook page, Google+ page, or our website for more unique pieces of jewelry! Today’s piece is a pair of earrings. These earrings are made of copper and Chinese crystals. The copper was hand cut and textured. This piece is currently available! If you would like this piece, a similar piece, or any unique piece of jewelry; contact us! Don’t forget to check out our Facebook page, Google+ page, and our website for more wonderful pieces of jewelry! Today’s piece is a pair of earrings. 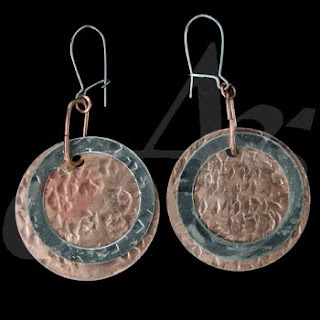 These earrings are made out of copper and nickel sheet metal. Both pieces are hand cut, stamped and textured. The copper link attaching the metals to the kidney hook, allow the copper circle and nickel ring to slide on each other – giving a neat dimension! This piece is currently available! If you would like this piece, a similar piece, or any unique piece of jewelry; contact us! Don’t forget to check out our Facebook page, Google + page, or our website for more wonderful pieces of jewelry! Today’s piece is a pair of earrings. 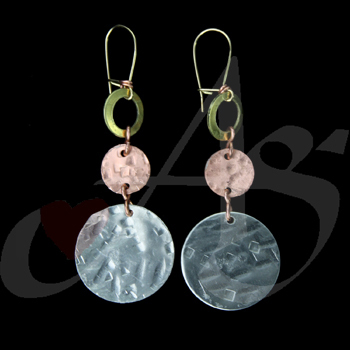 These earrings are made with Green howelite wrapped with hand stamped copper. This piece is currently available! If you would like this piece, a similar piece, or any unique piece of jewelry; contact us! Don’t forget to stop by ourFacebook page, Google+ page, or our website for more wonderful pieces of jewelry! Today’s piece is a pair of earrings. 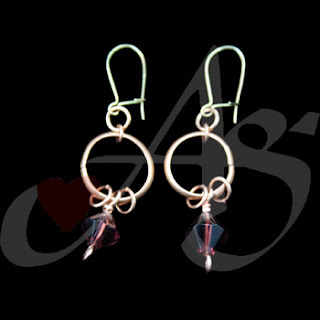 These pair of earrings are made with copper sheet metal and beige Swarovski crystals. Each of the pieces of copper were hand-cut. This piece is currently available! If you would like this piece, a similar piece, or any unique piece of jewelry; contact us! Please stop by our Facebook Page, Google+ Page, or our website for more wonderful pieces of jewelry! Today’s piece is another pair of earrings. 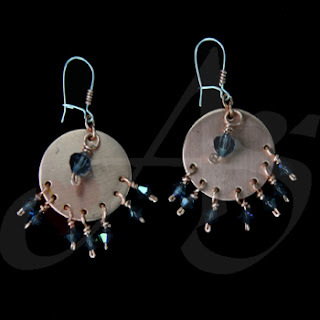 These earrings are made with blue Swarovski crystals attached to copper. The copper was hand cut and punched from sheet metal. This piece is currently available! If you would like this piece, a similar piece, or any unique piece of jewelry; contact us! Don’t forget to stop by our Facebook page, Google+ page, or our website for more dazzling pieces of jewelry! Today’s piece is a pair of earrings. 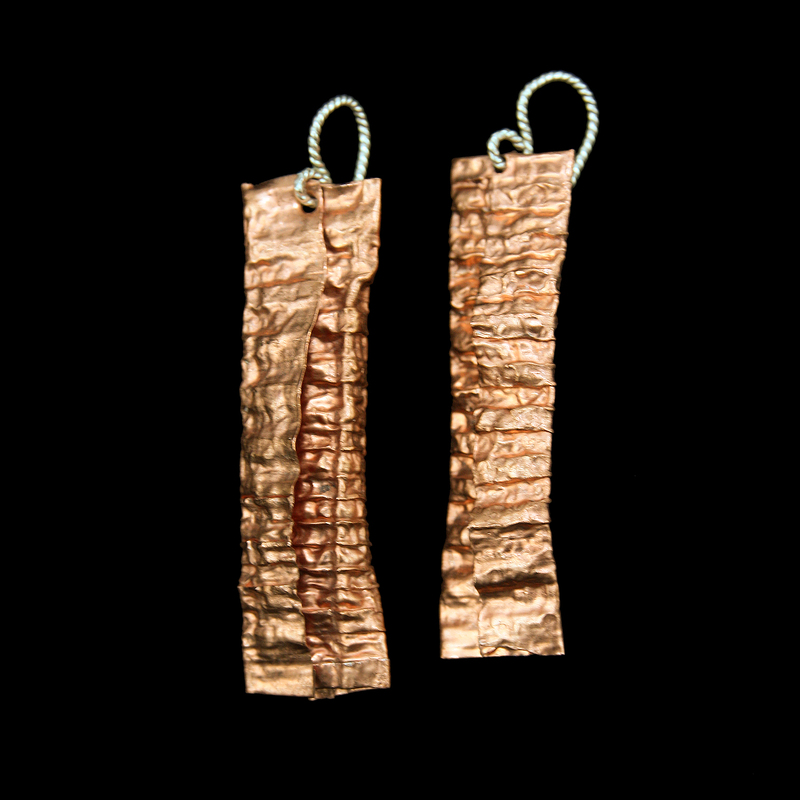 These earrings are made with copper and brass sheet metal. The copper is hand cut and hand stamped. The brass, which is not attached to the copper, was hand stamped and hand manipulated. This piece is currently available! Today's piece is a pair of earrings. 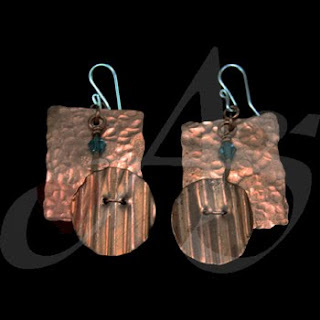 These earrings are made with copper sheet metal. These pieces of sheet metal were hand manipulated to gain the texture and volume seen here. This piece is currently available! If you would like this piece, a similar piece, or any unique piece of jewelry; contact us! Don't forget to stop by our Facebook or website for more beautiful pieces of jewelry! Today’s piece is a pair of earrings. These earrings are mad with copper sheet metal and Swarovski crystals. The copper was hand cut and hand texturized. This piece is currently available! If you would like this piece, a similar piece, or any unique piece of jewelry; contact us! Stop by our Facebook page and website for more great pieces of jewelry! Today’s piece is a pair of earrings. 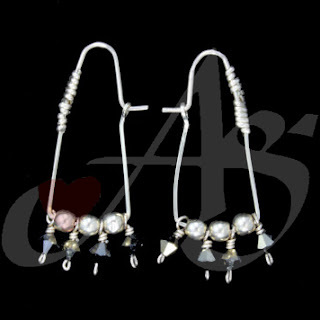 These earrings are made with sterling silver, crystals and pearl. The sterling silver was hand cut and hand stamped. The roundel of crystals is a series of 8 set Chinese crystals. 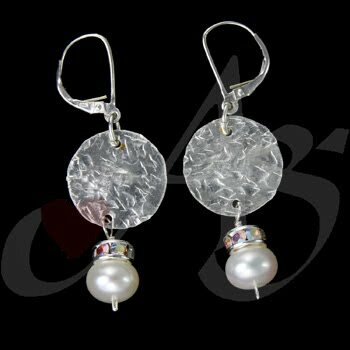 On the bottom are white sheen freshwater pearls. This piece is currently available! If you would like this piece, a similar piece, or any unique piece of jewelry; contact us! 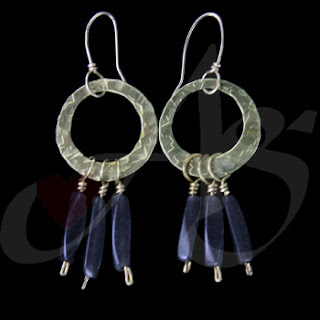 Please stop by our Facebook page and website for more great pieces of jewelry! Today’s piece is a pair of earrings. 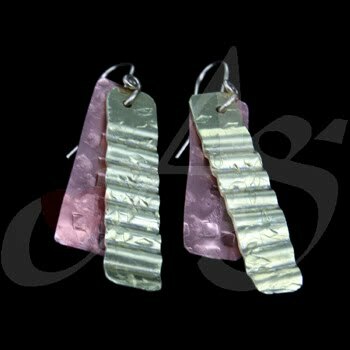 These earrings are made from hand cut pieces of nickel sheet metal. Hanging from the kidney hook is a red Chinese crystal. This piece is not available. If you would like a similar piece, or any unique piece of jewelry; contact us! Please stop by our Facebook page and website for more wonderful pieces of jewelry! Today’s piece is another member of the new line released two weeks ago. These earrings are made with nickel, copper, and brass. Each of the pieces are hand cut and hand stamped. This piece is not currently available. If you would like a similar piece, or any unique piece of jewelry; contact us! 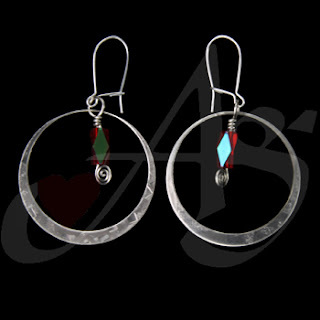 Don’t forget to stop by our Facebook page and website for more beautiful pieces of jewelry! 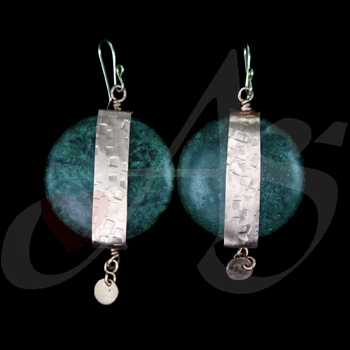 Today’s piece is a pair of earrings from the new jewelry line. 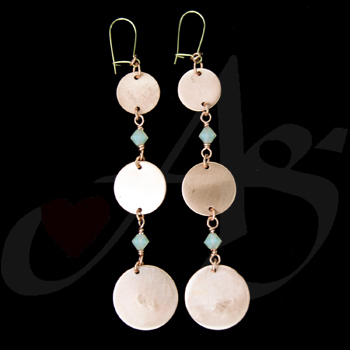 These earrings are made with brass, copper and nickel metals. The large base circle is hand stamped and textured brass, with hand stamped nickel attached by copper wire. This piece is sold. If you would like a similar piece, or any unique piece of jewelry; contact us! Please stop by our Facebook page and website for more wonderful jewelry! On November 26 and 27, Agape Gifts will be participating in the Catholic Sale at Sacred Heart of the Hills Parish in Auburn Hills, MI after all of the weekend Masses. The Mass schedule is 4pm on Saturday, 9am and 11am on Sunday. A portion of our profits will be helping Sacred Heart of the Hills Parish. Support the local Faith community by purchasing your jewelry and religious material from us! This is also Small Business Day, support your local business by purchasing merchandise from them! For more information on small business day, click here. On November 19, Agape Gifts will be in Clinton Township from 1 to 4 for a private home show. If you would like to join us, please email us for more information. Today’s piece is a pair of brass earrings. 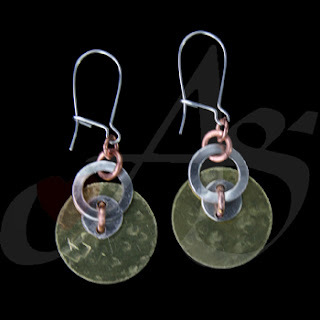 These earrings are manipulated pieces of brass sheet metal into a semi-circle. These pieces were then hand texturized with a series of stamps. This piece is currently available! If you would like this piece, a similar piece, or any unique piece of jewelry; contact us! Please stop by our Facebook page or website for more wonderful pieces of jewelry! Today’s piece is a pair of brass earrings. These earrings are textured, as well as manipulated pieces of brass sheet metal. This piece is sold. If you would like a similar piece, or any unique piece of jewelry; contact us! Don’t forget to stop by our website and Facebook page for more great designs! Today’s piece is a pair of earrings. 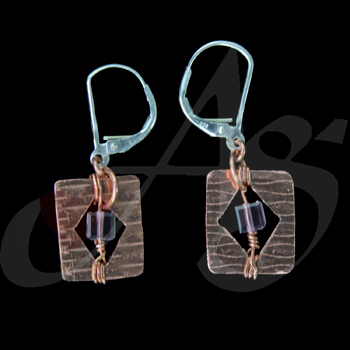 These earrings are made with shells and copper wire. 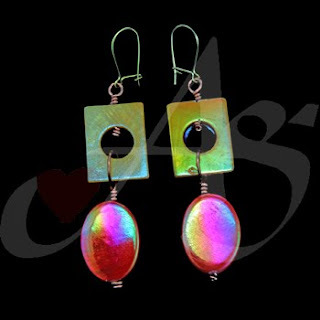 These are dyed mother of pearl shells, coated with aurora borealis to give them a wonderful sheen. This piece is currently available! If you would like this piece, a similar piece, or any unique piece of jewelry; contact us! 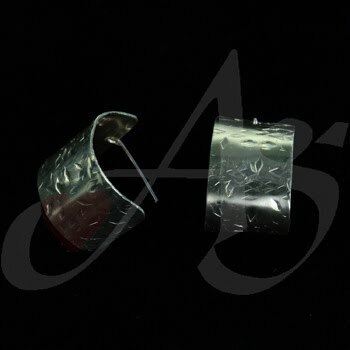 Don’t forget to stop by our website and Facebook page for more great pieces of jewelry! Today’s piece is a continuation of our new line. This is a pair of earrings. These earrings are made with shells. 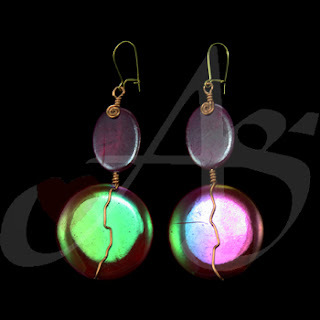 The top shell is dyed purple, and the bottom shell is dyed fuchsia with an aurora borealis coating. The bottom shell is wrapped with copper wire. This piece is currently available! If you would like this piece, a similar piece, or any unique piece of jewelry; contact us! Please take time to stop by our website and Facebook page for more wonderful jewelry! 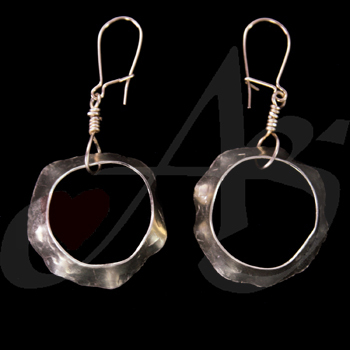 Today’s piece is a wonderful hand made pair of earrings. These earrings are made with copper, half round wire formed into a circle, with two copper jump rings and a faceted purple Japanese crystal hanging from the center. This piece is currently available! If you would like this piece, a similar piece, or any unique piece of jewelry; contact us! Stop by our website and Facebook page for more pieces of jewelry! Today’s piece is a rosary bracelet. 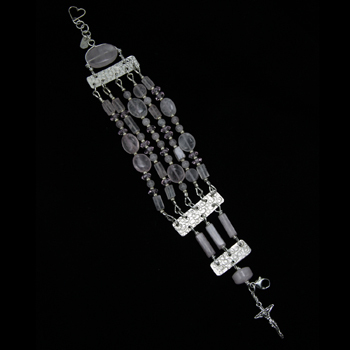 This rosary bracelet is made with rose quartz, in a variety of shapes. As with yesterday’s piece, this is also a full rosary. The Sterling Silver sheet metal pieces are the “our Father” beads. This piece is currently available! If you would like this piece, a similar piece, or any unique piece of jewelry; contact us! 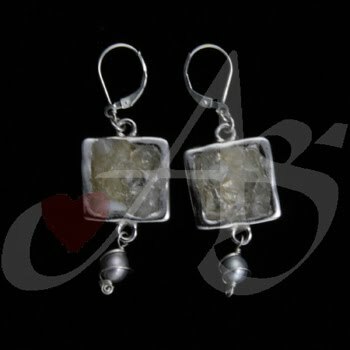 Take a look at our website and Facebook page for more great pieces of jewelry! 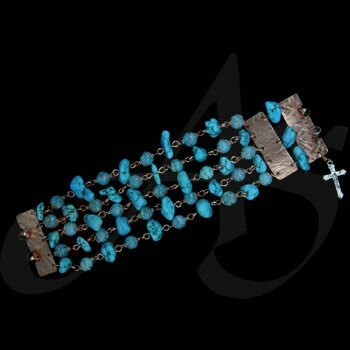 Today’s piece is another rosary bracelet. This rosary bracelet is a full rosary bracelet, in that there are 5, 10-bead decades, with the 3 beginning “Hail Mary’s” with the copper pieces being the “Our Father” beads. The beads in this bracelet are aqua turquoise. This piece also has a magnetic clasp. This bracelet is currently available! If you would like this piece, a similar piece, or any unique piece of jewelry; contact us! Please check out our website and Facebook page for more great jewelry!! Today’s piece is a Contemporary Rosary Bracelet. This bracelet is one of our new pieces; which we will be highlighting for the next month or two, since we have 50 new pieces to share! This Rosary Bracelet is unique, because each of the ‘dangles’ is a ‘Hail Mary’ bead, so there are 53 of these dangles. 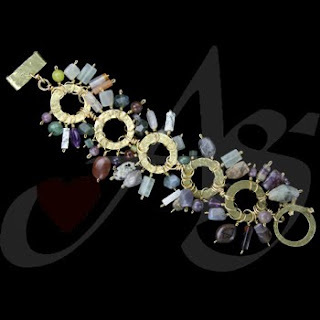 This bracelet has a wonderful jingle to it, and is closed with the Agape Gifts™ Toggle! If you would like this piece, a similar piece, or any unique piece of jewelry; contact us! Don’t forget to stop by our website or Facebook for more wonderful pieces of jewelry! Here are all the new pieces for the October 2011 Line. This page will only be available for 24-hours, then the jewelry will be interspersed with the rest. Enjoy the pieces!! If you see anything you'd like, contact us!! Today’s piece is a wonderful necklace. This necklace is strung with ribbon. On the ribbon are patches of Chinese crystals and fiberglass cat eye beads. The piece de resistance is a .999, fine silver pendant. This piece is currently available! If you would like this piece, a similar piece, or any unique piece of jewelry; contact us! Please check out our website and Facebook page for information pertaining to our new line tonight! Okay, I am not able to access this from my computer, therefore I am unable to upload of a "Piece of the Day". Stay tuned to Facebook to find out which pieces are featured each day, along with when all the new pieces will be put on the website for a limited sneak preview! Hello, Oh faithful viewers. Due to terrible technical troubles, Agape Gifts is unable to post images to this blog. We are currently working on fixing this. In the meantime, please refer to our Facebook Page where the piece of the day will continue, along with additional contests and information. You do not have to be a member of Facebook to view this information. We would also love to see you on Friday for the 9th Annual Agape Gifts seasonal show, where we will be unveiling the newest line of jewelry. If you would like to attend, or need more information, please e-mail us.